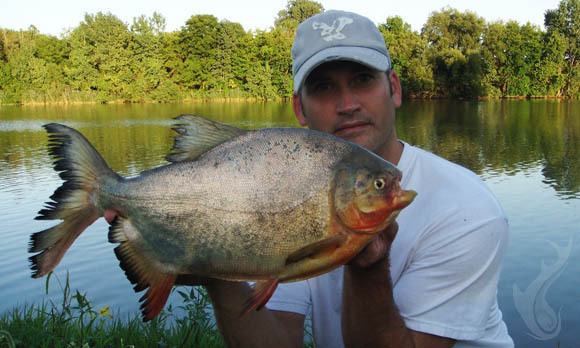 The story of my #5.11/20.25″ Red Belly Pacu caught in the Sandusky River near Fremont, Ohio, is pretty well traveled across the web in the years since the catch was made. If you found your way here though, you can hear the story firsthand. While getting this rod ready, I saw that the other rod that I had wedged in the rocks, had fallen over. Just in case there was a fish, I did a slight tug to set the hook. Immediately after setting the hook the rod vibrated in a very unusual fashion. The fight felt peculiar and I knew it wasn’t a carp. The fish surfaced and turned over at the top of the water about 20 feet from shore, with me catching a glimpse of the reddish orange coloration and shape. I screamed for a net and my mind could only register ‘giant Bluegill” from the image that had flashed in front of me. Before I could rehearse my speech for catching the all tackle world record Bluegill, I needed to get the fish landed. While the fish would turn out to be epic, the fight was not. Due to the fact I was targeting carp, my tackle was suitable for much larger fish. The fish itself, also helped by swimming right towards shore. Rather than truly having to ‘fight the fish’, after the first few seconds, I just guided it towards me as it was swimming in the right direction. I beached the fish right as the net arrived, securing the fish by pinning it against the rocks. Once secured, I just stared at it in disbelief, it was a fish species that I had never seen. I wasn’t sure exactly what I had caught. As a somewhat proficient multi species angler, all I was sure of, was that I had caught some type of invasive species. I knew this wasn’t a fish that should be in these waters. Seeing the teeth when removing the hook, I wrongly thought it was a Piranha. If I were more proficient in the aquarium trade, maybe I would have known what it was. I placed the fish in a large cooler and filled it with river water as I collected my thoughts. While I was super excited, I had no idea what the proper thing to do with the fish was. While contemplating that, I shot a short video holding the fish and did a good number of photos. The fish was returned to the cooler and was doing fine, swimming around in it upright, with no sign of stress. The fish was probably doing better than me at this point, I was still in shock. As I started to settle down, I called a friend who is a fish biologist and aquarist for Bass Pro Shops. 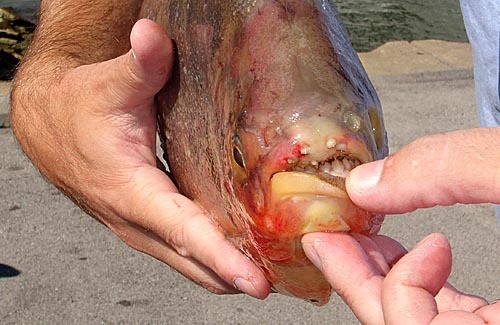 I described the fish, and he correctly ID’ed the fish as a Pacu over the phone. I tried calling both the Cleveland and Toledo Zoo’s, wanting to donate the live fish. Unable to reach anyone and knowing I would not release an invasive species back to the water, I decided I would have the fish mounted. I made a trip to the local WalMart and they were willing to give me a weight for the fish on a certified scale. After the weighing, I put the fish on ice and headed towards home. I stopped by Riverfront Marina and Campgrounds to show the fish to the Zoller family who has had this business on the Sandusky River for a couple generations. They had never seen anything like it. The next day, I stopped by the Sandusky ODNR Research Station. 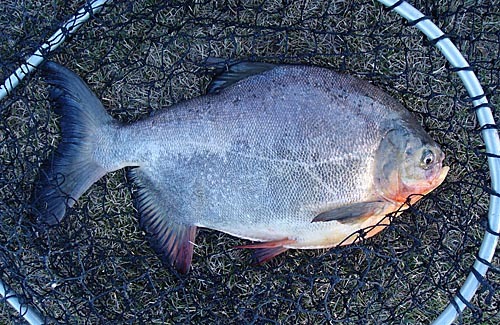 I showed the fish to ODNR biologist Travis Hartman who also identified the fish as a Pacu. We talked for quite awhile and I learned more about invasive catches amongst all kinds of other fishing topics. He had a wealth of knowledge and someone who clearly has a passion for what he does. A big thank you to him for spending that time with me. Once the fish was at Jim’s Taxidermy in Port Clinton, I decided to phone the local paper in Fremont. I thought maybe I was over enthused about the catch, but surprisingly the story was eagerly accepted. In a few short weeks the story ran in every Gannett owned newspaper in Ohio. It also ran in The Toledo Blade and I was seeing it all over the internet. Some places I knew about and others came as a complete surprise. The most shocking was seeing it on ESPN Outdoors and probably the neatest was the Port Clinton News Herald due to the fact it ran on the front page in color. I am a long time fan of Steve Pollick, so getting a chance to talk to him and see it in the Toledo Blade was a memory in itself, as well. In the end, the specific newspapers I was able to track down and get copies of were; Fremont News Messenger (page 3) & Port Clinton News Herald (front page, color) on 9/2/09, Bucyrus Telegraph Forum (3B) on 9/3/09, Toledo Blade (C, page 4) 9/11/09. As a multi-species angler that has always enjoyed scouring the internet for stories of surprise or odd catches, I was thrilled that one of those great stories happened for me. Who knows how many countless hours I have spent finding fish stories that intrigue me, but this story required only looking at my outstretched hand, staring at a fish that had no earthly business being in this water and finding my hook. While I must concede these catches do happen with a little more frequency than I knew (ODNR said 2-3 times a year in Ohio), I still see my catch as more profound than most of the stories I can find for Ohio or any other state. This is due to the fact that my catch happened at a location that wasn’t ‘land locked’. Many of these catches take places in ponds and reservoirs where I can almost see this as people doing their own ‘put & catch’ fishery. I wont go as far as to say it’s suspicious, it just doesn’t compare to a fish that had the entire Great Lakes at its disposal. At least to me, it makes the catch seem better and even more unlikely. So there you have it, my best fishing story and two seconds of fishing fame! It is highly unlikely that I will ever catch anything as crazy and surprising. I hope you enjoyed reading the story as much as I enjoyed telling it. It honestly never gets old for me. As fun as the catch was, it should have never happened. I reported the catch to the USGS and please read the disclaimer below. Please act responsibly and never release a species into a natural environment to which it does not belong. The negative impact of doing this, could be profound. Very interesting to hear another one was caught around here. Send me a picture of yours if you get a chance. My email is coolwaterfish@yahoo.com. Thanks Misty! 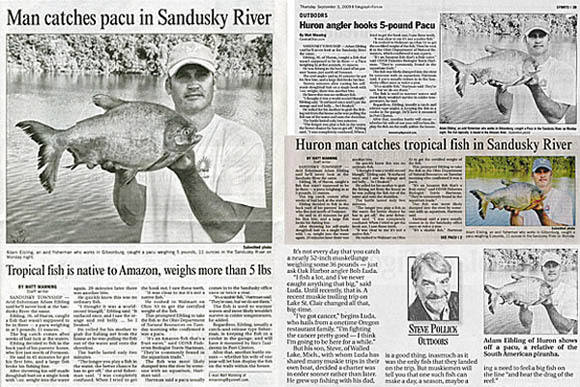 I was with a vfriend of mine at the wauseon resivoir in wauseon ohio in 2005-06 or so and he caught a 19 inch pacu and we heard a couple more were caught there that summer i believe one of the local papers covered it.